Local SEO and Online Marketing are important for local businesses. The businesses that embrace these marketing components will likely flourish, while those that do not will likely perish. The following links to an 8 part article series on the Yoast Blog will be useful in understanding the importance of Local SEO and how to execute a local marketing plan correctly. Yoast has many other useful local marketing articles also. They are the developers of the Yoast SEO WordPress Plugin that we use on all of our sites. I highly recommend them as a valuable source of local online marketing information. Ranking your local business at Google: part 1 of 8 NOTE: The other articles in the series are available from the first one. Below is a brief section of the first article. Previously, we published an interview with local SEO expert David Mihm on our SEO blog. As a lot of you liked this interview, David and Yoast decided to join forces and publish a series of posts about Local SEO. In this series, David will go over the various aspects that contribute to your local rankings. Take it away, David! 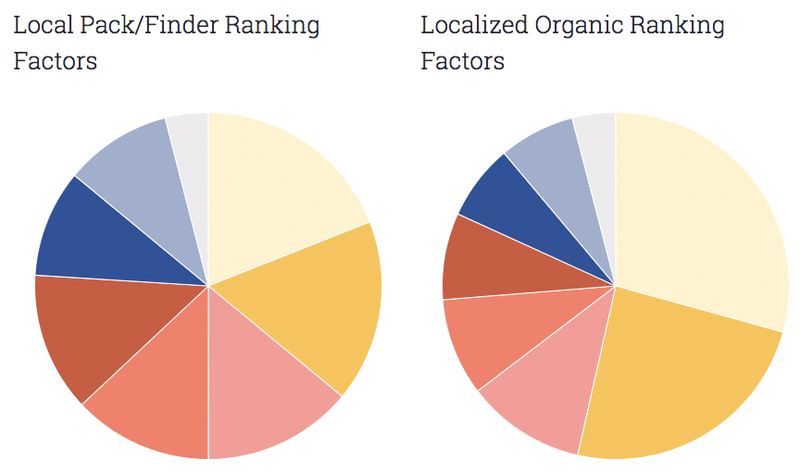 For the last nine years, I curated and published the annual Local Search Ranking Factors survey. Experts from around the world ranked the tactics to SEO success for their – and their clients’ – businesses in this survey. The survey results have become a starting point for many small businesses and marketers, as they learn about how to get their business more exposure on Google. This year, Darren Shaw of Whitespark took over data collection and analysis and published the results on the Moz blog. Since I conducted the first survey, the local search landscape has changed a lot. To give you a sense, back in June 2008, the first Android mobile phone hadn’t even been released yet. In that time, we’ve gone from a world where local search primarily meant “ten blue links” for desktop searches and shifted to local pack results on mobile phones. Now we’re increasingly going into a world of single answers from voice-controlled assistants. And it’s true, at its core, Google has always tried to provide searchers with the ‘best’ result for a given query. (Though that’s modulated slightly in the last couple of years as ads have become more prevalent.) But the ‘best result’ depends on the context of the query. The type of search and the location of the person searching provide Google with two vital pieces of context. Consider a search like [get more followers on Instagram]. No matter where I’m performing that search – mobile or desktop, home or on the go – I’m looking for an answer to that pain point, anywhere in the world. I’ll largely find the answers on webpages – through the ten blue links – featuring products, case studies, or articles about how to do so. With a search like [coffee shop], though, Google can have pretty high confidence that I’m looking for a place to grab a latte right that moment. I probably want a place pretty close to me, no matter where I’m performing the search or on what device. Sure, I could browse a magazine article about the best coffee shops in my city or look at a full list of coffee shops on a directory page. But it’s much more useful for Google to simply return a list of places, rather than other websites about places. 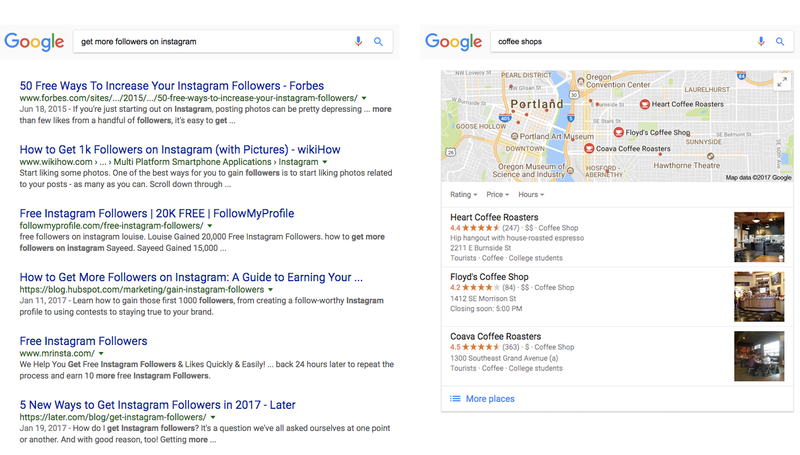 Google’s webpage-related results [Instagram followers] and its place-related results [coffee shops] are generated by two different algorithms. Searches with specific questions like [How do I make chimichurri?] are likely to trigger a third kind of result called a Featured Snippet. But that’s a topic for another day! As a local business, you’re going to face fierce competition in the webpage-related results. If you offer services to help get more Instagram followers, you’ll have to compete with every other provider of this service on the planet to get your website ranked. But in the second instance, when Google detects a search that has local intent you’re only competing with other coffee shops near you. Note above; I didn’t even specify my city, Google just inferred it. And even though Starbucks has coffee shops in just about every town and city in the world, it’s harder for them to stand out against local brands in these place-based results. And these results are also featured in Google Maps, in-car navigation devices, Google Home/Assistant searches, and many other media. Over the last few years, Google has gradually shown more and more of these place-based results for local queries and fewer webpage results. I mentioned this trend earlier and will discuss it in more detail in the last installment of this series. Even the webpage results that show up beneath these place results on a local intent search have been infused with local business websites since early 2012. Regardless of medium (desktop, mobile, or voice), and regardless of the type of result (webpage or place-related), Google remains a significant source of customers for many local businesses. So it’s critical to put your best foot forward to attract those customers in both algorithms. Inspired by the response from this community to my last interview with the Yoast team, I thought I might expand on my answers. I’ll, therefore, provide a more detailed look at each of the major building blocks of a successful local search strategy. Below, you’ll find a list of the building blocks I’ll deal with in the following installments of this series. What are those components? Google likes to say “relevance, prominence, and distance.” And while that’s not misleading, it is an oversimplification.